dailydelicious: Sausage Cheese Rolls with Hand Knead Instruction. I love to knead bread, and you can see that most of my recipes are hand knead. But I got many questions from my friends who want to try but feel a bit timid. Knead bread is not a hard thing to do, you may not master at the first time but when you knead a lot you will know the rhythm and the nature of the dough. Even you can't stretch the dough into a thin sheet, you can try by touching the dough and count to 10, if there is nothing stick to you hand, the dough is ready to rise. I believe that kneading bread is fun and stress relieves, I love the feeling that when I knead I always think about the people who I love and they will eat the bread after baking. Ps. Most of us didn’t break the gluten by hand knead so don’t be shy to use a lot of strength in kneading. 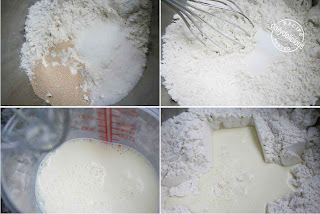 Put the flour, the sugar and yeast in a bowl, whisk to combine, add salt whisk again. Pour the egg and milk mixture into the bowl. Cut the dough into 12 pieces, roll into a ball and let them rest for 10 minutes. 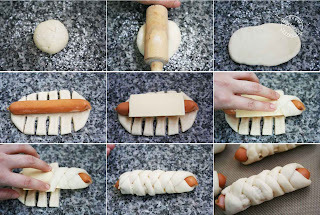 Using a rolling pin to roll the dough into an oval shape, place the sausage in the middle, cut both side of the dough into strips, and place half of the cheese slice over the sausage. Fold the strips alternating the left and right over the sausage. Place the dough on the oven sheet, lined with non stick baking paper (the cheese will melt while baking and some will leak). Preheat the oven to 200°C. Let the dough rise until almost double in size, brush with egg wash. Bake for 8 minutes then reduce the temperature to 180°C and bake for 5 minutes more or until the rolls are golden brown. Very Clever, Easy and beautiful. Now I found your blog, I wish to try your method.
" One egg plus whole milk"
Another question, will the dough stick to your hand. Do we need to coat our hands with flour?
" One egg plus whole milk" mean you crack the egg into the measuring cup then add enough milk (not low fat milk) into the cup to equal 220-230g. I've omitted the cheese. Is that the reason why my sausage rolls did not turn out as beautiful as yours (the rolls do not have the distintive twisted lines)? Also, why the rolls are not fluffy and soft? Is the texture supposed to be like your sweet corn rolls? BTW, I used bread machine to do the kneading. Could you also please advise the amount of instant yeast and salt required in "tsp" measurement 'cos I only have an analogue scale at the moment? I would like to try making these sausage rolls again. 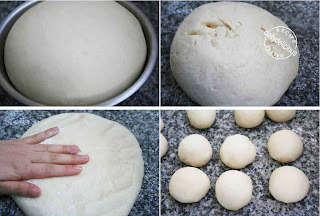 Hi I can't seem to knead the bread dough as exact as what you have shown in the picture. I've tried twice and both times after 30 mins the dough still look sticky & doesn't look smooth? Why is that so? The problem can be the flour. The different of the brand can be the different of the origin, so the capability of the flour to absorb the water is different. Hope your bread will be better. Can we use low fat milk ? And also can we use frozen susage ? Yes, you can use low fat milk, but about the frozen sausage, I suggest thawing them before using. The coldness in the sausage will make the dough rise very slow than usual. I have 1 problem. I always have sticky dough. If I dust my hand and table with flour... it is ok... but after a few knead... it start to stick to the hand again. Is this normal? What flour should I use to dust the table or hand? Do I need to knead very hard? The flour that use for dusting the table is bread flour. About your problem, you can change into lightly grease your hand with a bit of butter, it helps to keep the dough from the stickiness too, and it doesn't harden the dough like when you use a lot of flour. I made this and it's a hit in my family! Thanks for sharing this and your very useful step-by-step pics! Hi, I've tried this and it was my first success in baking! Thank you so much for the detailed recipe! Take a look at my blog for my picture! Thanks for this great recipe! I made it yesterday and it was really good! I've posted it in here. I am going to try this for my family. I have a question though. Do you need to add warm milk to the milk-egg mixture to make it rise faster? Cause I have rapidrise yeast at home, and it says to use some kind of warm liquid. You can use either warm or cool milk, it's up to the fact that you want it to rise fast or slow,^ ^. For me I use cool milk because it's quite hot in Thailand, so the cool milk will slow down the rising speed of the yeast and make the bread taste better. Did your dough taste like the bread is not done yet or it's hard? 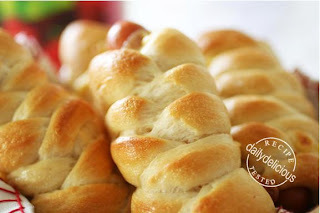 be cause too much flour will cause the bread too hard and the taste if the dough taste like it's not done you might bake too short, you can lower the heat and use longer time. Hi, just wondering, for the sausage, mine are frozen in the freezer. So if i want to bake it that time, do i just take it out of the freezer and defreeze it inside my microwave first, then i can bake it? By the way, wont the sausage become very soft baking inside the oven for so long? I don't know what kind of the sausage that you will use but usually I recommend to warm the sausage to room temperature before using because the coldness from the sausage will effect the rising time of the dough. Mine is not soften after baking, ^^. I made this recipe yesterday and my family loved it!! My dough didnt look as elastic as your, but it work out really well. I am having a problem with the measurement. What is the easiest way to transform gm to cups? I found some info in the internet,but they are very inconsistent,and I believe accuracy in baking is a must! Thank you! I am a fan!!! and if you want to post photo for me, you can post on my facebook wall. Just want to say thank you so very much for posting this step by step. 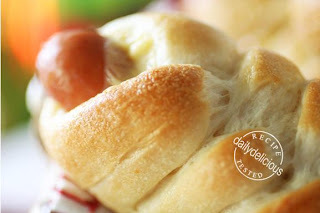 I FINALLY found a bread recipe that makes Asian bread which I could make here in the US. I had to do it twice to get it right tho. The first time around I only had skim milk and light butter. Plus I overproofed the dough a little bit. So they deflated after the second proof. The second time around I bought whole milk, regular butter and even still over proofing the dough a little bit the rolls came out beautifully! Oh, I used 1tsp of mini choc chips in each roll instead of sausage. I can imagine how you feel after reading your comment, ^^ and it makes me so happy too.